The next designer to be featured in Creative Quarters is Camilla Carvalho. 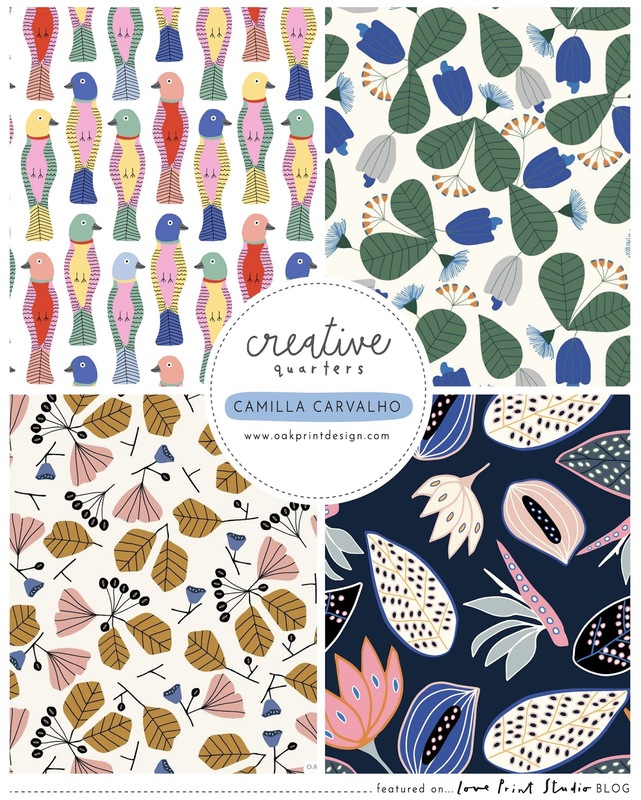 Oak Print Design is the creative studio of Camilla Carvalho. Camilla is a Brazilian self-taught surface pattern designer and illustrator based in Montreal, Canada. Her Brazilian heritage is definitely present in her designs through nature inspired motifs and bold colors. As a child she loved drawing and painting but she never pictured herself on that career path until her kids were born. Before being a pattern designer she worked for almost 10 years in the financial industry and that’s when she started to realise that she really liked the creative world. Having to prepare several presentations for clients, she was always the one that would pay more attention to the formatting details than to all the numbers. Camilla then decided to leave the financial world and pursue her passion. She took some graphic design courses until she finally discovered the surface pattern design world and fell in love with it. She draws most of her motifs by hand and then works on them in Illustrator afterwards. She loves to walk around outdoors taking pictures of leaves, flowers, buds and everything else that might inspire her. She also loves to get inspiration from botanical illustrations. Some of her clients are Quiltweaves, Julius Zoellner, Estudio iCertain, Printed Village and Minted. She would love to see her designs on a fabric line and home goods but her biggest dream is to see her designs on a swimwear line, maybe because she is Brazilian, right? Camilla will be exhibiting at SURTEX this year where she will be showing lots of bold maximalist patterns with eye-catching color combinations that create an expressive feel and statement. please visit the links above. If you missed the last Creative Quarters post featuring Carly Watts, you can read it here.